Proposals to Develop Hebrew Home Presented to Community | Park View, D.C.
On Thursday evening, May 25th, DMPED hosted a meeting at Raymond Recreation Center so that the seven most promising development teams could present their ideas to the community on their ideas to renovate the old Hebrew Home property. All teams presented idea to convert the historic structure into housing and construct new housing to the east. However, no two presentations were exactly alike, with key differences being the number of units proposed, the amount of affordability of those units, and the density of the buildings. A chief concern voiced by many residents was the impact that the development would have on area parking. There were also differing opinions on how much housing should be affordable, and how much density or height the new construction should be for the right balance. The Powerpoint presentations from the meeting are available online here. Members of the public are invited to review them and provide any comments through an online forum available here: https://goo.gl/frtYFa The forum will close on June 9th. Comments: More information is needed on levels of affordability. Powerpoint available here. Comments: Would be the fastest to build as it would be a by-right project, but is also problematic as it has no affordable units outside of the senior units. Additionally, six of the rowhouses are planned on the site of the historic Hebrew Home which would require HPO and HPRB approval, which I find doubtful. Powerpoint available here. Comments: This project would be completed in three phases, with the Hebrew Home building being the first phase. This proposal is the most sensitive of those that were presented with regards to the preservation and renovation of the Hebrew Home building, with a commitment to preserve/restore interior elements of the building as well. Of the projects that proposed more density, this proposal has good harmony and relationship to the historic structure. Powerpoint available here. Parking spaces provided: contained in each new rowhouse. Comments: This team proposed the least number of overall units for the site, with nearly all of the affordable units being for seniors in the Hebrew Home building. The rowhouses proposed reflect the rowhouse character of the surrounding neighborhood. Powerpoint available here. 15% of units will be set aside for families at 30% of AMI. Parking spaces provided: 49 surface parking spaces. Comments: This is a good architect and developer, but the number of affordable units is at the minimum amount required. There is no dedicated senior housing, and the current design isn’t as compatible or sensitive or compatible with the surrounding community as other high-density proposals. Powerpoint available here. Parking spaces provided: underground parking. Comments: The density of this project was compatible with the existing Hebrew Home building. One of the merits of this proposal was how it focused on greenspace. The green roofs, landscaping, and particularly the deep set back on 10th Street which included a wide sidewalk and benches were features that should be incorporated into the final project regardless of who the developer is. Powerpoirnt available here. Comments: This was a good group who indicated a wiliness to create more affordable units if the District would be willing to provide additional financial support. It was the only proposal to include permanent supportive housing for residents formerly homeless, and the team demonstrated a record of other deeply affordable projects that they had completed. Powerpoint available here. This entry was posted on May 26, 2017 at 2:51 pm and is filed under Development, Historic Landmarks, Housing. You can subscribe via RSS 2.0 feed to this post's comments. I enjoyed the presentations. I live in the vicinity and I felt Bozzuto or CPDC were the best. I do agree that both should include the 10th St upgrades/setback. I hope they go for one of the lower density ones that don’t completely overwhelm that corner. With as much setback and green space as possible. Agree. I also like Bozzuto’s plan. They did an excellent job with Monroe Street Market in Brookland. They also have a reputation for well managed developments and long term commitments to the neighborhood. Several of these developers seem a ilttle out of their league – albeit well intentioned. I like that one too, although it would be nicer if they left room for a little park at 10th and Spring. Bozzuto was the best and by far fit the neighborhood best. Mission was the worst, awful design and had no plan for parking. The CPDC/NVR proposal is not the way to build homes in an urban setting. I don’t like that the rear of the townhomes would face the streets. Good urban design says you face the front of townhomes toward the street. I hope that one is rejected. I don’t mind maximizing density in this location. It is super close to the Metro station. I like the Mission First, Gilbane Development, NHP Foundation, and Bozzuto proposals the most (in that order). Re: Mission First – the design could use help but like the proposal elements. Mission First and Gilbrane seemed way over their heads and naive when it comes to this large of development. I agree with the others, as someone who lives three blocks away in Columbia Heights, Bozzuto was by far my top choice. Second choice would be CPDC or Borger. I’d prefer if Borger had a design more in line with the neighborhood aesthetic though. The CPDC/NVR proposal includes row-house style townhouses that DO face the street. Each row house has its own garage and driveway on the rear of the home for parking, which will ensure parking on 10th Street remains open for Raymond School and Rec Center. This is NOT the place to maximize development. THIS IS NOT GEORGIA AVENUE. This is a quiet residential row-house neighborhood, which anyone who actually lives here will adamantly tell you. 10th and Spring are not major thoroughfares, and the increased traffic and lack of parking will be a huge problem for our quiet streets. The Mission First property is a disaster. 224 mostly rental units (the most dense of all the developments), with hulking six-story buildings towering over the row homes and the residential back yards that the property faces on 10th and Spring. Parking will be totally inadequate. Spring Road (one lane in each direction) will become gridlocked with traffic from hundreds of additional residents. 10th Street NW (a quiet one-way street) will become overwhelmed with lack of parking and increased traffic. The architecture is brutal and destroys the row-house aesthetic of the neighborhood. This proposal is a total nightmare. The Gilbane development is also terrible. 212 mostly rental apartments, with terrible five-story construction towering over the neighborhood’s historic row homes. It also features a “parking podium”, which is essentially a street-level (eye-level) parking garage with housing built above and on top of it. This is NOT the same as an underground parking garage. Studies show that parking podiums disconnect residents from the neighborhood by placing their dwellings above street level and minimizing interaction with the neighborhood community, which is not what our neighborhood is all about. Their proposal also does nothing to improve 10th Street. They describe “street lights”, “street trees”, and “side walks” as their contribution to improving the 10th Street streetscape. How nice of them to include street lights so we can see the damage they will have done to our quiet neighborhood. The only two developments that make sense here are Bozzuto/Menkiti and CPDC/NVR. 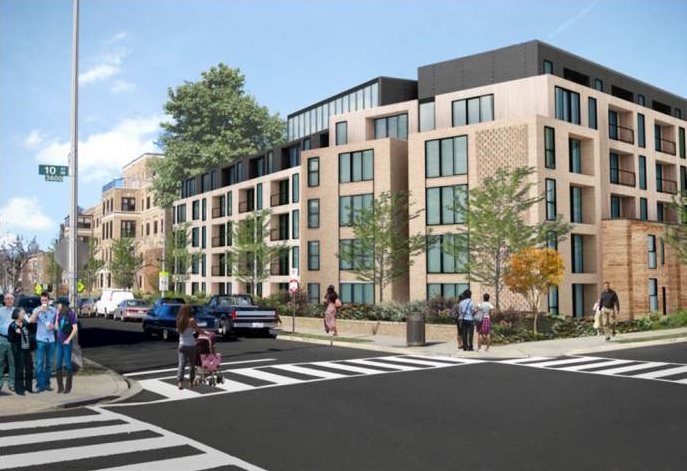 The Bozzuto/Menkiti proposal includes moderate density (146 units) that is appropriate to the neighborhood context and provides 100% affordable housing for seniors weighted heavily towards those with the greatest need (>70% of the housing will be for those making <50% AMI). 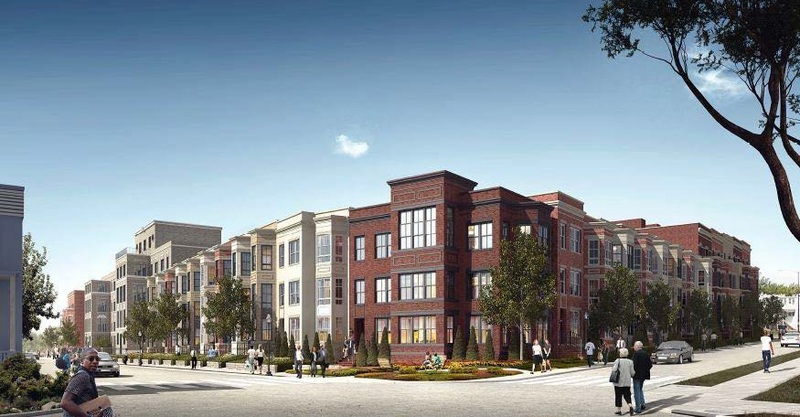 The architecture blends seamlessly with the neighborhood, with brick rowhouses being built on 10th St and Spring Rd that reflect the character of the surrounding neighborhood. The proposal also includes rear driveways and garages to provide parking for all of the new residents, and provides a new alley to keep cars and traffic off of 10th Street and open for use by Raymond School and Rec Center visitors. The proposal also includes a new pocket park at the corner of Spring and 10th. Because no PUD is required, this can be built quickly. The excellent CPDC/NVR proposal is also of moderate density (109 units) and includes brick row-house architecture that is consistent with the neighborhood context. The proposal includes 100% affordable housing for seniors (with 46% of the units targeting seniors making less than 30% of the area median income), and 75% affordable overall. 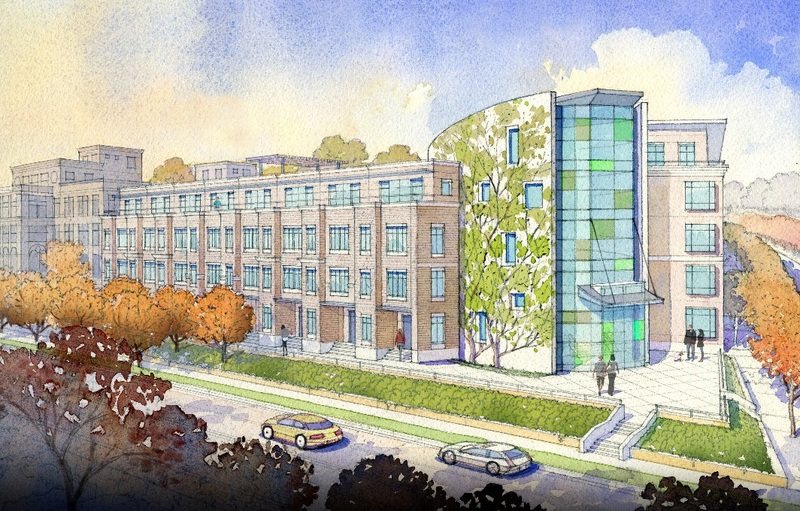 Unique to this proposal, 12 senior units will be fully handicap accessible. All of the townhouses will also have a garage and a driveway for parking, an alley to help keep traffic and cars off of 10th Street, and features a community garden and courtyard, a fitness trail with outdoor fitness equipment for community use, and public art installations to help beautify our neighborhood. I highly encourage all of our neighbors who live in our community to RESIST THE HIGH-DENSITY OVERDEVELOPMENT of our quiet residential neighborhood and the activists who don't live here and don't care about us. SUPPORT the Bozzuto/Menkiti or CPDC/NVR proposals to ensure our homes and our yards aren't dwarfed by huge sky rises, our streets aren't overwhelmed with new traffic, and that our parking situation remains as tenable as possible. Support moderate density that is sustainable and that will encourage neighborhood and community growth, vitality, and sustainability. CONTACT the City Project Manager, Tsega Bekele, at 207-727-6365 or tsega.bekele@dc.gov. Let him know that you support moderate density that minimizes parking and traffic disruptions and that blends within the existing neighborhood. Let him know that we won't allow the course of our neighborhood to be turned over to activists and big-government overreach. Be sure to let him know that you live in this neighborhood and that your voice matters most. CONTACT your ANC representatives, such as Bennett Hilley, Sharon Farmer and Kent Boese. CONTACT your Ward 4 and Ward 1 Council Members (Brandon Todd and Brianne Nadeau) and let them know that we the residents of this neighborhood are depending on them and need their support. CONTACT the Mayor Muriel Bowser's office and let her know that we support her plan for INCLUSIVE economic growth and resilience, that the Bozzuto/Menkiti and CPDC/NVR proposals fit best with her vision and with building and strengthening this neighborhood. Interesting that “Concerned 10th Street Resident” slanders those he disagrees with as people who don’t live in the neighborhood, yet posts anonymously. How many years have you lived in DC? What gave you the right to say working families can’t live here? The CPDC homes do face the street with wide, inviting front porches that match the rest of the homes in the neighborhood. The Mission First design is awful. Greatly prefer CPDC or Bozzuto. It looks like the brutalist style architecture of the 1970’s (i.e. FBI Building, DC Library). No thanks. I couldn’t agree more! I think it looks really, really bad, and that the developers totally disrespected the neighborhood by proposing such a hulking structure. I think the Brutalist architecture is way out of place here alongside 100-year old row homes, although surely some activists and lobbyists will be screaming “Brutalist works here because…proximity to Metro!” LOL.